Ok, before you start hating on me for posting a street-style photo of Whitney Port, let me say this: I didn’t know who she was when I photographed her. I’ve never seen an entire episode of Laguna Beach or The Hills or any of the spin offs. She did look vaguely familiar, but being really into street-style blogs means that everyone I see on the sidewalks at New York fashion week looks vaguely familiar. The reason I lifted my camera to shoot her was because of the white button-down shirt. I’ve been thinking a lot lately about different ways to wear that ultimate classic. When investing in a white button-down and you should be prepared to lay down some cash. The first piece of expensive clothing I ever purchased was a white button-down Theory shirt when I was 19. The cut was so flattering and I remember feeling like adult – a true adult – the first time I wore it. That’s the magic of fashion; the way we present ourselves has the enormous transformative power. Versatility is key when selecting staple pieces like a white button-down shirt. As Alton Brown says about kitchen tools, “no unitaskers!” and the same should apply to your closet fundamentals. If you don’t know what a unitasker is, well… I guess there’s no hope for you. 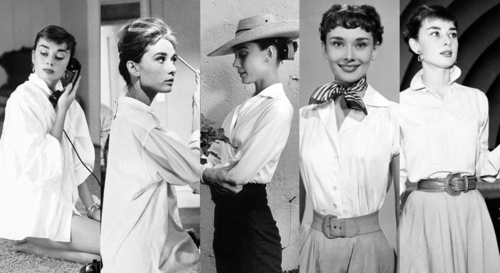 A white button-down shirt can be layered under a jumper for an Alexa Chung “geek chic” vibe or worn oversized, a look made famous by none other than Audrey Hepburn. It’s not just button-downs that are multitaskers; even the most extravagant pieces like a Rodarte sweater can be worn in a multitude of ways, tossed over a flowy gown for a more typical Mulleavy-esque ethereal vibe or over what else, a white button-down shirt for an office ready outfit! Great style is all about creating unexpected combinations with the things you already own. Think of the white button-down as the ultimate blank palette. 1. Fabric. Cotton with a bit of stretch is my favorite for a close fitting look, but for an oversized vibe think about investing in pure 100% cotton. 2. Cut. Look for a shirt with darts around the breast and a tailored fit unless you are going for the oversized look, in which case I suggest you purchase a men’s button-down in the appropriate size for the proportion you are aiming for. 3. Price. For a quality white button-down you can find designer pieces on sale like I did with my Theory shirt, which I purchased at a steep discount from Neiman Marcus Last Call in the Detroit suburbs. All of my non-Theory button-downs are by J.Crew, which makes my favorite close-fitting shirt. It’s about $70 for the style I like, the stretch perfect shirt. For a boxy menswear inspired look I’ve always reached for Brooks Brothers, a store where you really can’t go wrong with button-downs. My favorite part of this picture is the AMAZING shoe in the background! I love the vintage outfit (pencil skirt and hat) along with the very trendy shoe (with the cutout at the ball of the foot). So great! i love whitney and i agree! the withe shirt should be a must in every ones closet!